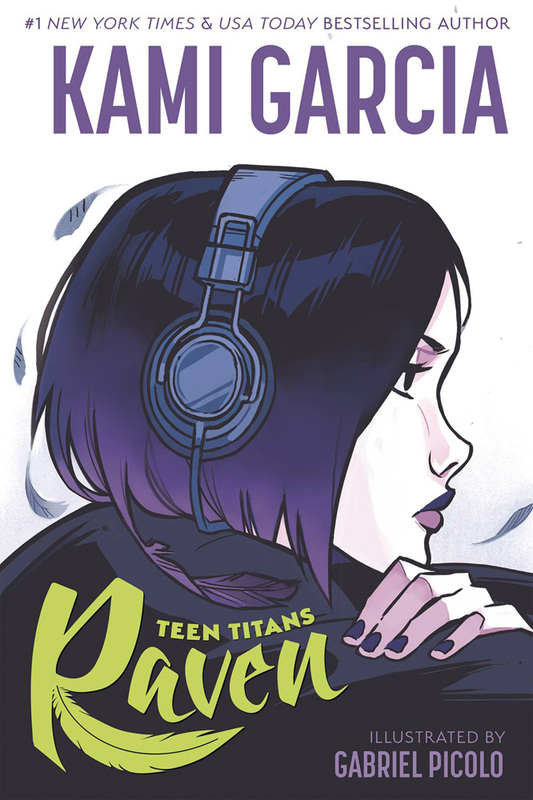 Teen Titans: Raven is a 176-page softcover graphic novel (the first in a Teen Titans series for DC Ink, DC’s new imprint aimed at young adult readers) written by Kami Garcia with art (and cover) by Gabriel Picolo. It fills in some blanks on the mysterious Teen Titans character. When a tragic accident takes the life of seventeen-year-old Raven Roth’s foster mom – and Raven’s memory – she moves to New Orleans to live with her foster mother’s family and finish her senior year of high school. She remembers how to solve math equations and make pasta — but she can’t remember her favorite song or who she was before the accident! And then, strange things start happening… Teen Titans: Raven ships in late June. Six Days: The incredible True Story of D-Day’s Lost Chapter is a curious release for DC/Vertigo. 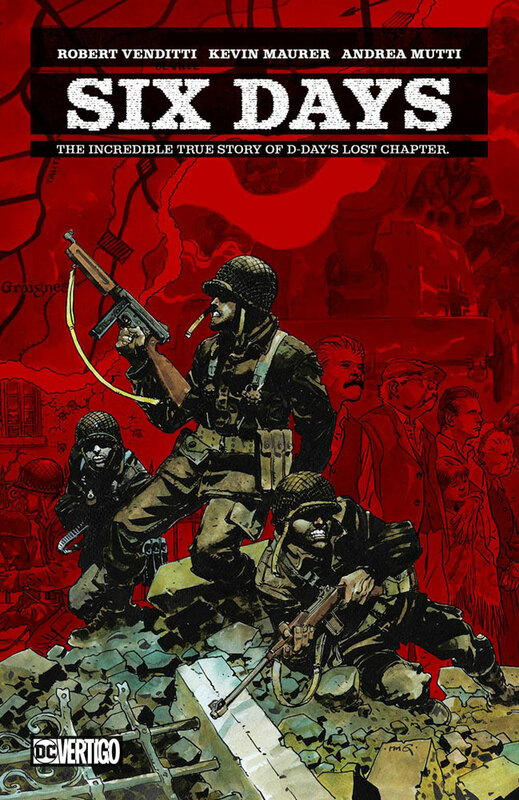 Written by Robert Venditti and Kevin Maurer and with art and cover by Andrea Mutti, this is a true story of an obscure World War II battle that took place in the small village of Graignes, France, for six days. It starts when 182 members of the U.S. 82nd Airborne Division parachute into the French countryside — a full 18 miles southeast of their intended target. Before long, these troops are drawn into battle with 2,000 enemy combatants. Co-writer Robert Venditti — whose uncle fought in the Battle of Graignes as a key character — completed comprehensive archival research for this unbelievable untold story of World War II. This 136-page graphic novel ships in May. Bits o’ DC stuff: Jonah Hex appears in Adventures of the Super Sons #9. 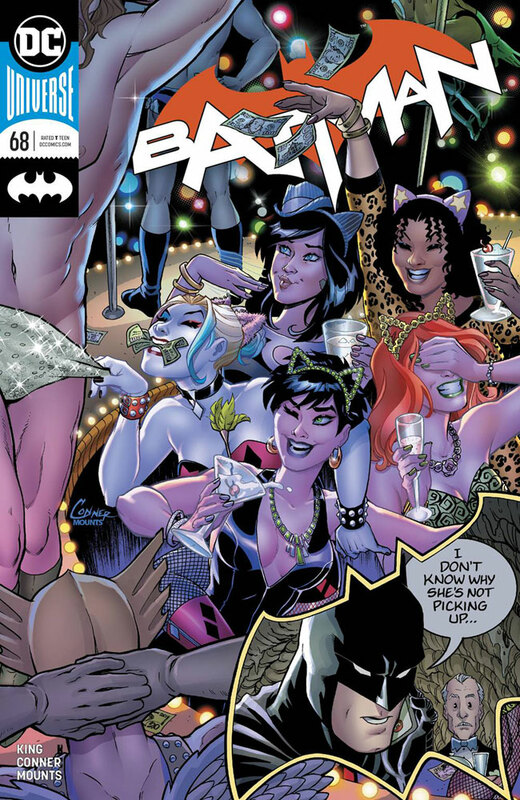 No, I don’t know how… Amanda Connor is the guest artist on Batman #68 — featuring a bachelorette party that never was. (This looks like fun! What’s fun doing in a Batman book?) Then, wait ‘til you see what happens in Batman #69! . . . Meanwhile over in Detective Comics #1,001 and 1,002 (I just wanted to type those numbers) someone called the Arkham Knight is looking for Mr. Batman . . . The Terrible Trio (The Vulture, the Shark, and the Fox) take over Gotham in Batgirl #34 . . . Adam Strange guests in Green Lantern #6 . . . In Justice League #21, the team must confront the Justice League of Tomorrow! Hope they don’t oversleep! Maybe Lex Luthor will shock them awake in JL #22!. . . Attention LSH fans! They don’t appear in Justice League Dark #10 — but their arch-foe Mordru does! . . . Naomi #4 is a good issue to pick up if you’re looking for answers about this mysterious new Bendisverse character! . . . Superman vs. Jor-El in Superman #10?!?! . 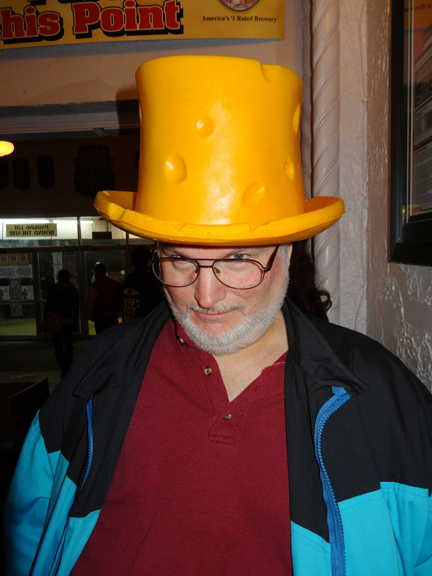 . . Who are the League of Annoyance? I’m sorta annoyed that I don’t know! Guess I’ll have to read Wonder Twins #3 to find out! 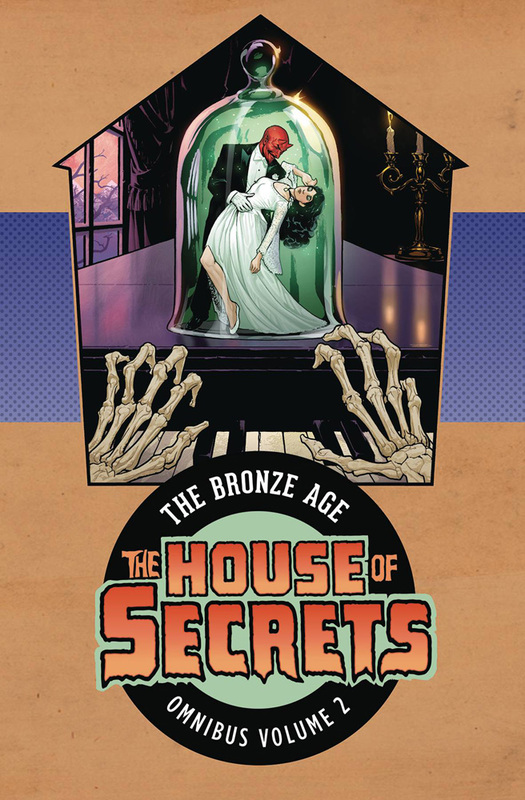 The House of Secrets: The Bronze Age Omnibus Volume 2 features a never-published Patchwork Man story from the 1970s, by writer Gerry Conway and artist Nestor Redondo. Pretty scary, heh, kids? 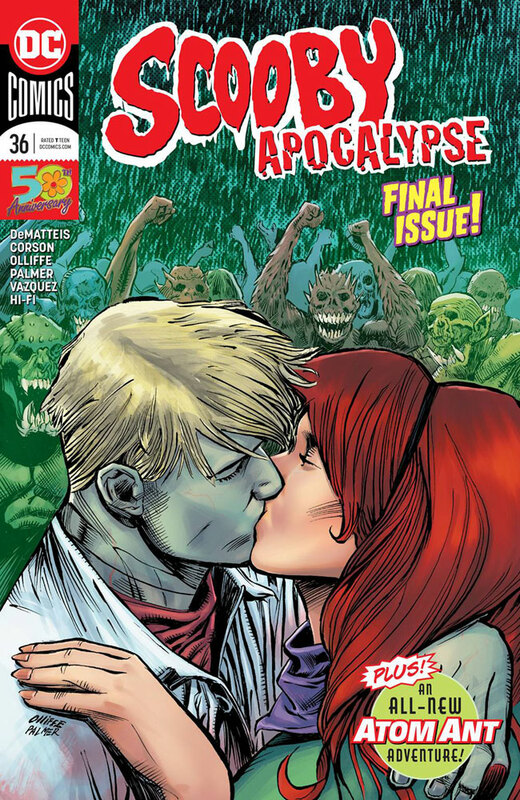 Scooby Apocalypse ends with #36 . . . Speaking of Scooby, there is no listing for Scooby Doo Team-Up this month either. Oh, dear, that’s one of my favorites! Titans is also cancelled with #36. 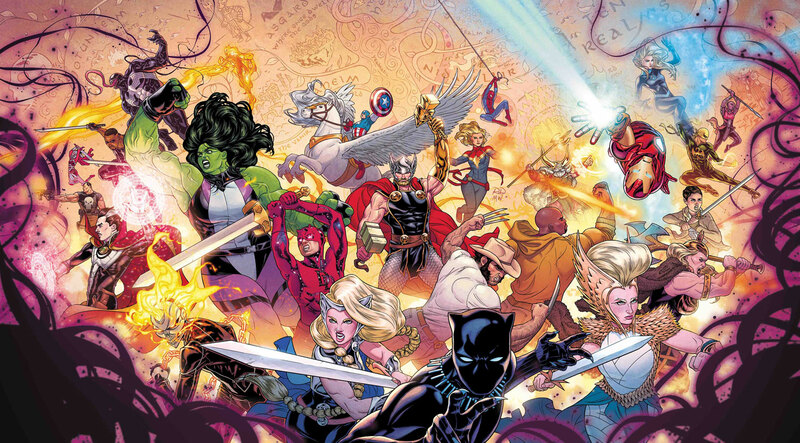 War of the Realms starts in April, written by Jason Aaron with artists Russell Dauterman and Matthew Wilson. 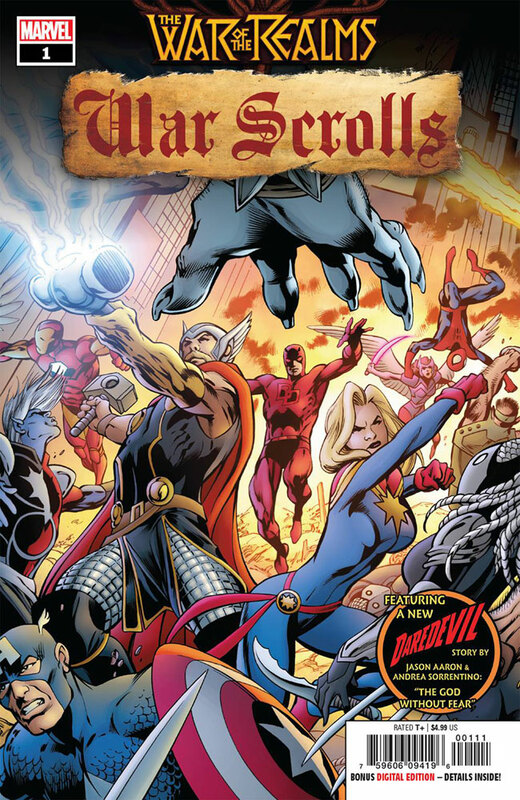 The main covers are by Arthur Adams and Matthew Wilson with, of course, lots of variant covers by folks including Walter Simonson, David Finch, Greg Horn, Joe Quesada, Amanda Conner, and Victor Hugo — who, last time I checked — died in 1885. Hmm. It appears that all the usual suspects (Captain America, Thor, Iron Man, etc.) 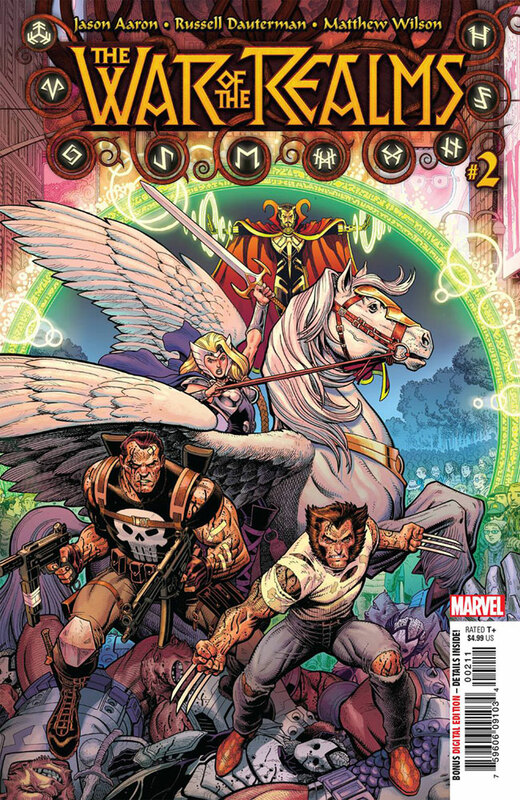 will be involved, although staring at the main promotional piece for the series unveils these odd surprises: Captain America riding Valkyrie’s horse (while she’s brandishing a pretty substantial sword in the foreground). Venom is involved (why?) as is the Punisher. Black Panther is prominent in the foreground, as is Captain Marvel (who I hear has a new movie out soon — March 8, in fact, here in the US). Some guys who aren’t always prominent in these big superhero slam-fests include Daredevil, Luke Cage, and a street-clothes Wolverine. And for some reason Ghost Rider seems quite envious of Valkyrie’s sword. (It is, indeed, quite nice.) I’m quite amazed at the hair of the swordswoman in the foreground who seems to be dressed like an Asgardian Big Bird. I have no idea who she is, but I’m pretty sure somebody will tell me fairly soon. 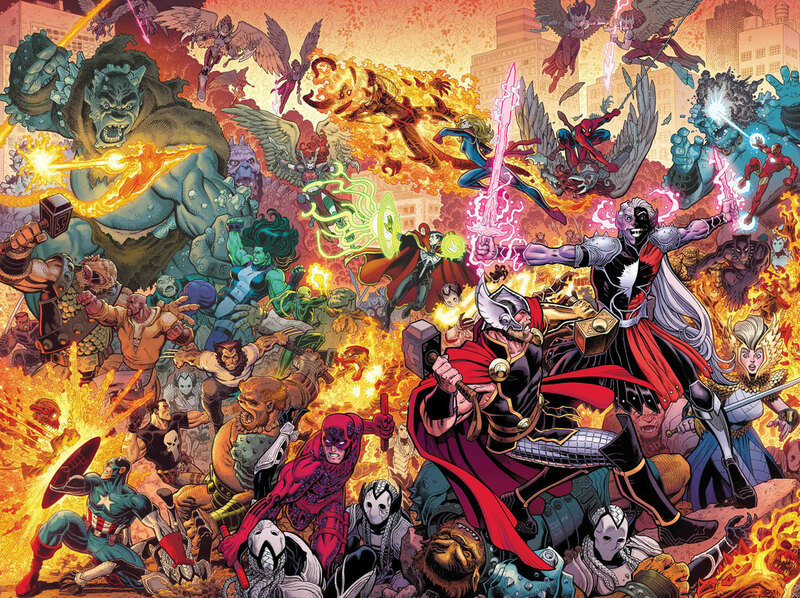 War of the Realms will be a six-issue series, with oodles of tie-ins including Thor #12, Avengers #18, Asgardians of the Galaxy #8, Venom #13, Unbeatable Squirrel Girl #43, War of the Realms: Journey Into Mystery (a five-issue miniseries), War of the Realms: Uncanny X-Men, War of the Realms: War Scrolls, and War of the Realms: Punisher (all three-issue miniseries), plus much, much more! 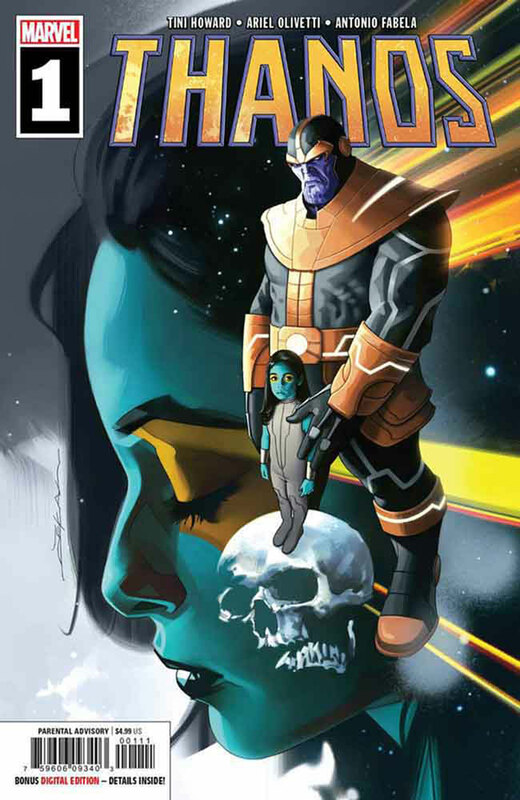 Thanos gets his own six-issue miniseries (which is a pretty good trick for a dead guy!) in April by Tini Howard and Ariel Olivetti and with main covers by Jeff Dekal. Apparently, this covers much of Thanos’ early life. I’m gonna guess that really bad high school yearbook pictures of him made him so crabby as an adult. 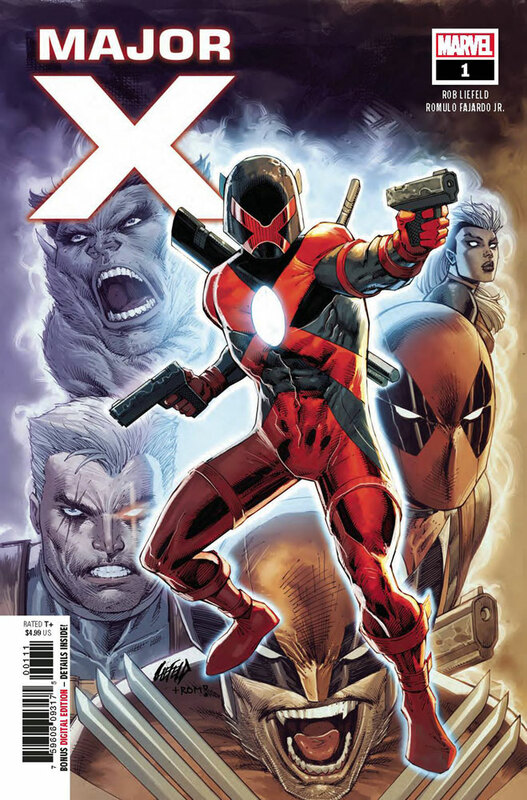 I suppose that somebody out there will be excited by a new six-issue miniseries written and drawn by Rob Liefeld about a guy named Major X — but I’m probably not one of them. He’s apparently a pal of both Wolverine and Cable, so at least he has people to talk to. 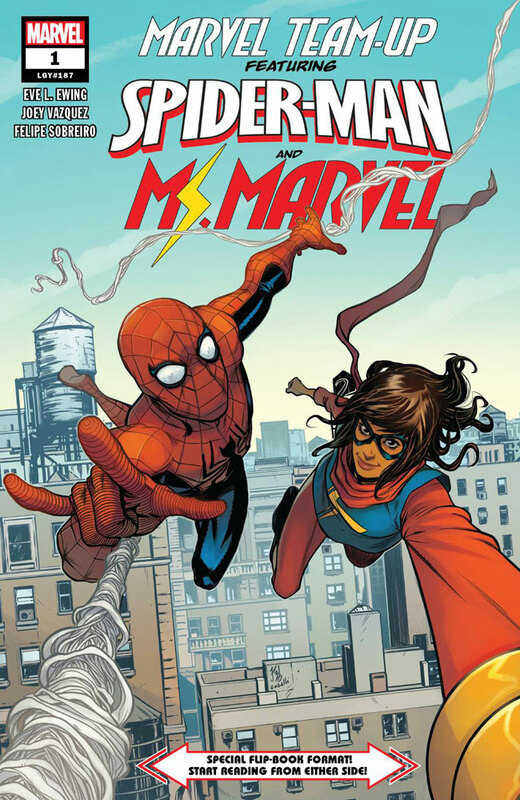 OTHER STUFF: Marvel Team-Up returns in April with a new #1 pairing Spidey and Ms. Marvel. It’s by Eve L. Ewing and Joey Vazquez . . . The Secret History of Namor is revealed in Invaders #4 by Chip Zdarsky and Carlos Mango with Butch Guice . . . Bad things are happening in Immortal Hulk #16 . . . Doctor Strange guests in Superior Spider-Man #5 (I always thought that Doc acted a little superior) . . . Old Man Quill vs. Fin Fang Foom! in Old Man Quill #4. Isn’t Fin older than all these other “Old” guys? . . . Miles Morales and Ms. Marvel visit Wakanda in Shuri #7 . . . Now here’s a selling point: Prepare to have your childhood memories destroyed in Cosmic Ghost Rider Destroys Marvel History #2 . . . It had to happen! 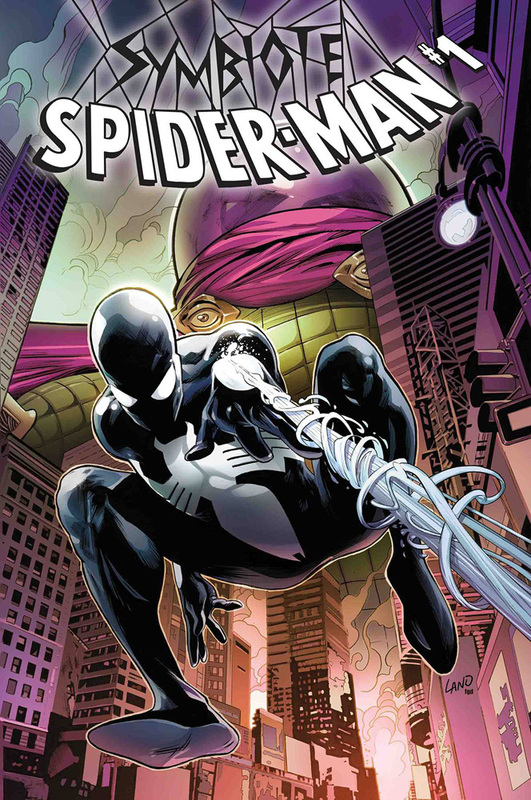 Spider Man/Deadpool (in #49) destroy the Fourth Wall, unleashing the danger from The Other Side of the Page! . . . What the heck is going on at Marvel these days?!? Destroy, Destroy, Destroy! Can’t we all just be friends? WESTFIELD COMICS is not responsible for the stupid things that KC says. Especially that thing that really irritated you. Obviously 40 degrees below zero is irritating me. I think the cold is affecting everybody’s brains. Yum! Brains!